Megalograptus was an Odrovician eurypterid that was about 4' long and had long, spiny "arms" that were probably for catching prey. Megalograptus could have preyed upon animals such as small orthocones, trilobites, early fish, conodonts, and possibly small echinoderms. It was probably prey for giant orthocones, such as Cameroceras and Endoceras. 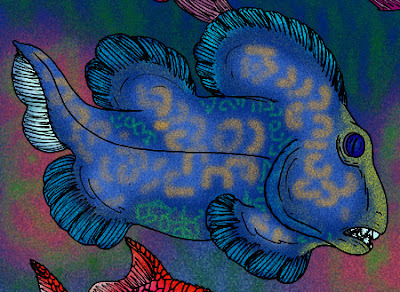 Megalograptus appeared in the Ordovician Period, and died out in the Ordovician mass extinction. Megalograptus had an odd telson, or tail, with two semi-circular plates on the side and a spine in the middle. The spine probably did not carry venom, but I believe that it may have been used to make Megalograptus appear to be venomous, which would warn off predators. The two semi-circular plates on Megalograptus's telson may have been used together, as a paddle to help it swim. Megalograptus also had paddles on a pair of legs that came off of the head, which I believe helped it steer. The first fossils of Megalograptus discovered were its appendages, so at first scientists thought the appendages were giant graptolite shells, which explains the name "Megalograptus," which means "great graptolite" or "big writing" (a lot of graptolite fossils resemble scribbles, lines, or writing). 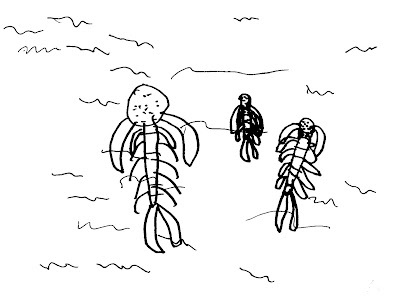 But Megalograptus was actually a eurypterid, or sea scorpion. Megalograptus is thought to be rare. But since it is found around common fossils such as brachiopods, trilobites, echinoderms, crinoids, and other creatures, it may have been more common. Megalograptus might only seem rare because the exoskeleton of most Megalograptus did not fossilize. Agnostid trilobites, or Agnostida, are bizarre trilobites that lived from the early Cambrian to the Ordovician mass extinction. 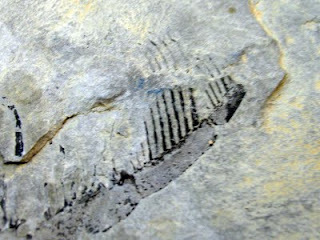 In some Cambrian rocks, Agnostids are extremely common, and they are also spread all over the world in the fossil record. But in the Ordovician period, Agnostids become rare. But I believe they were probably still widespread. A few Agnostid trilobite drawings of different species. [Artist unknown]. Most, but not all, Agnostids were blind, and they all were isopygous (meaning the pygidium, or tail, was the same size as cephalon, or head). 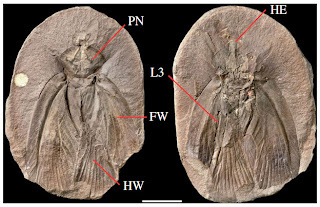 Unlike other trilobites, Agnostids only had two or three thoracic segments, and like the order Nekaspida, which include Naraoia, some scientists do not believe that they are even trilobites. Instead they think that both these orders are more closely related to crustaceans than trilobites, but not stem group or crown group crustaceans. 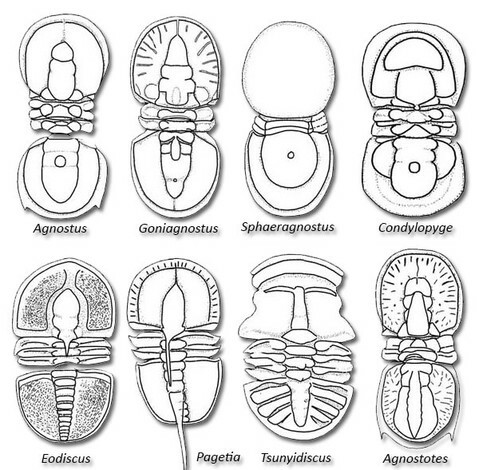 Agnostid legs were unique among the appendages of trilobites, because most trilobites have legs similar to those of a pill bug. Agnostids have their own unique arrangement of legs and other appendages. The ventral view of Agnostus, showing the legs and other appendages. Scientists disagree about whether Agnostids were benthic or pelagic. They seem to be benthic, because they are found with other benthic trilobites, and also have no eyes, which suggests that they would not be living at the surface where there is a lot of sunlight to help them see. But some scientists think they were pelagic because they are widespread, and usually pelagic animals can get to places more quickly and easily than benthic animals. Some Agnostids could have been benthic predators that cannibalized and hunted in packs. Agnostids can commonly be found sheltered inside the remains of dead animals, including the abandoned tubes of the priapulid Selkirkia. Since the ones found in Selkirkia all have their head facing out of the tube, it indicates that they must have backed in for shelter and protection. Since the molted skins of Agnostids have not been found inside the tubes of Selkirkia, it means that they probably did not go into the tubes to molt. Archimylacris was a Carboniferous genus of insect. Even though it looked like one, it was not a cockroach, but an ancestor. The first true cockroaches appeared in the Jurassic period, and the first modern cockroach appeared in the Cretaceous period. 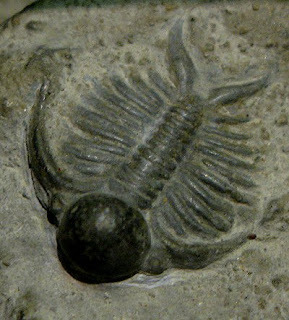 But the paleozoic "cockroaches" are not cockroaches but Blattopterans, which are ancestors of cockroaches, termites, and mantises. Archimylacris was very large, reaching up to 9 cm in length and 4 cm in width. It looked like a modern cockroach, except it was much bigger. It had slight differences, such as sticky pads on its legs called euplantulae and a long ovipositor. (Only the female had the ovipositor). The euplantulae may have helped it crawl on smooth surfaces, such as leaves, or possibly help it walk upside down like some modern insects do. This may have allowed it to escape from forest floor predators such as amphibians and early reptiles and allow it to climb tall plants. Archimylacris lived in the swamp forests of Europe and North America about 300 million years ago. It probably scurried along the forest floor and acted like a modern cockroach. The video below shows an animated CT scan of one of the fossils. 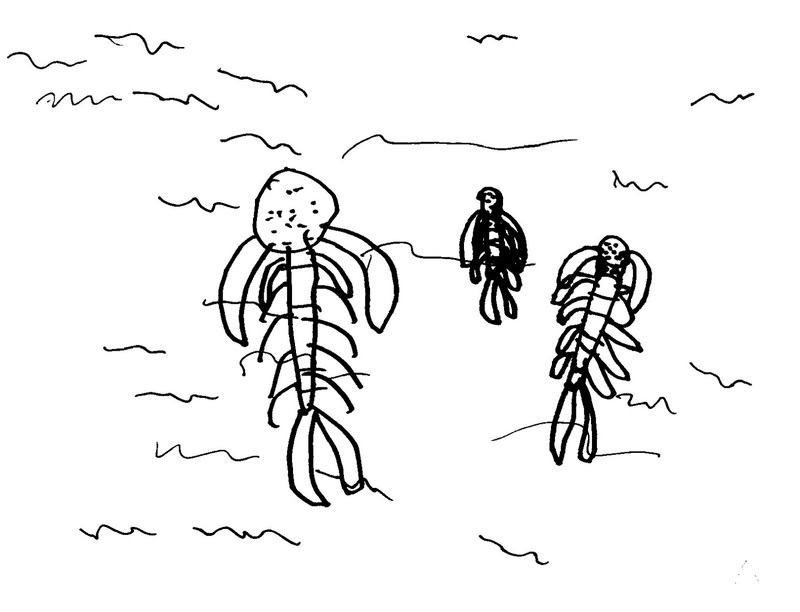 Scyphocrinites (sky-foe-cry-NITE-ees) is a genus of crinoid that lived from the late Silurian to the early Devonian. Its fossils have been found in Asia, North America, Europe, and Africa. Instead of being rooted to the ground like most crinoids, Scyphocrinites had a lobolith, which is a floating sphere that keeps an animal afloat in water. Unlike other crinoids, Scyphocrinites hung upside down at the surface. 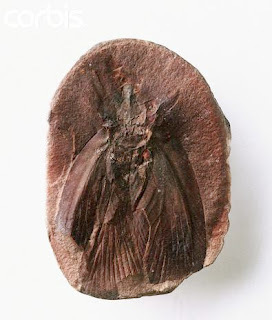 This is a fossil of a lobolith from Scyphocrinites. 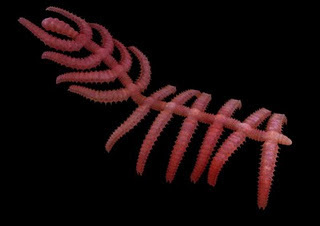 The lobolith would have allowed Scyphocrinites to move with the current, which benthic crinoids could not do. 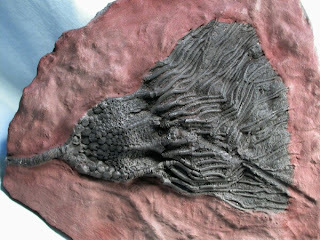 Scyphocrinites was probably the only crinoid with a lobolith, but there may have been others. 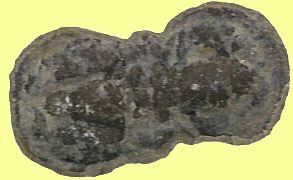 This fossil shows the calyx of Scyphocrinites. In zoology, a calyx is a cup-shaped structure. In botany, it's the sepals that protect a flower. The arms coming off of the calyx would have allowed it to snare tiny plankton to eat. We know that because living crinoids use their arms for the same purpose. Fossils of Scyphocrinites are sometimes found in huge clusters, similar to how the Cretaceous crinoid Unitacrinus is found. Belantsea (bull-ANT-see-uh) was a kind of cartilaginous fish from the Carboniferous period that was related to the Permian Janassa. Both of these fish are chondrichthyans called Petalodonts. I first read about Belantsea in Paleo Sharks by Timothy J. Bradley. 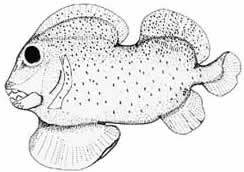 Belantsea had a large, lobe-shaped fin on its ventral side, right behind the mouth. I believe that this may have helped Belantsea steer. Even though Belantsea could steer and move very well, it probably could not move very fast because of its shape, which was not hydrodynamic. Belantsea had large teeth probably used to crush and eat hard-shelled animals such as corals and sponges. 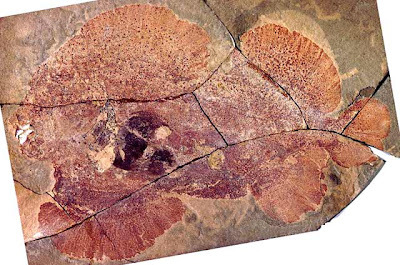 Fossils of Belantsea have been found in Montana and reach 2 feet in length. 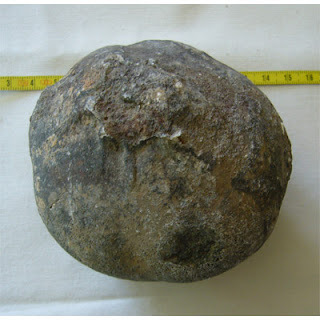 Fossils of Belantsea are rare. Deiphon is a Silurian trilobite which had long, conical spines on its body. It had a very large, round glabella, or middle cheek. 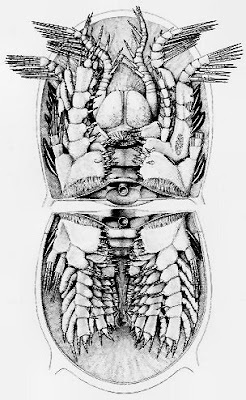 Some scientists believe the glabella was filled with fat or oil, to keep the trilobite buoyant. But others think Deiphon was predatory and that it stored prey inside the glabella. My interpretation of Deiphon on the Silurian sea floor. Deiphon's spines may have made it hard for larger predators to swallow it. Deiphon was either planktonic and ate phytoplankton, or was benthic and predatory. 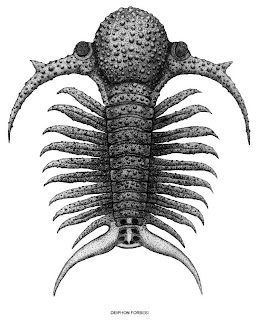 Deiphon had long, curved spines along its thorax, and two spines that formed a v-shape on its pygidium, or tail. It also had two spines on its cephalon, one on each side. Deiphon's thorax was much skinnier than that of most other trilobites. All these odd features would have made Deiphon a very strange trilobite. Click image to see more of Christian Richet's illustrations.